There are a number of parking options available for shopping, dining and playing in downtown Dahlonega. In addition to the convenient 275 parking spaces on and surrounding the Public Square, downtown Dahlonega maintains three free parking lots with 140 spaces just a short walk to our most popular destinations. The two free parking lots at the intersection of Meaders Street and Choice Street are conveniently located near the Dahlonega Visitor Center. 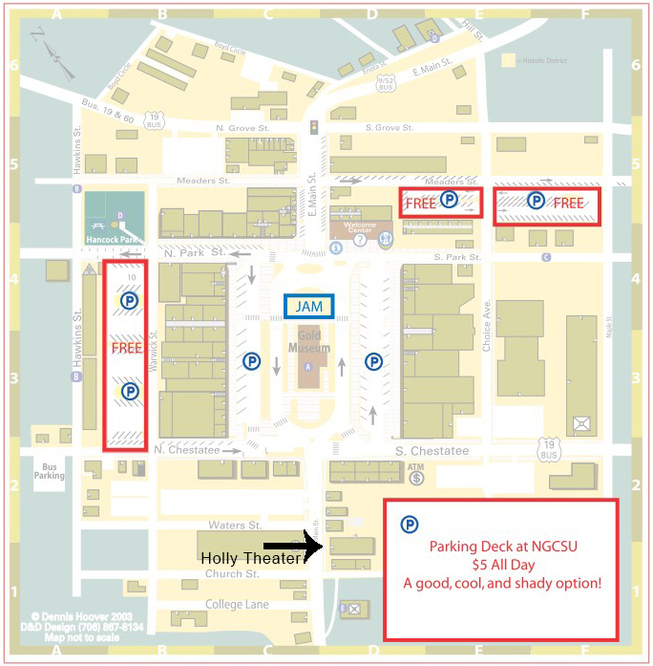 The third free parking lot is located on Warwick Street between North Chestatee and North Park Streets (perfect for Hancock Park events!). Another great option is the parking deck located at University of North Georgia. The University parking deck is FREE to the community after 5:30 on weekdays and on weekends. Patrons can enjoy this shady parking deck option year round.